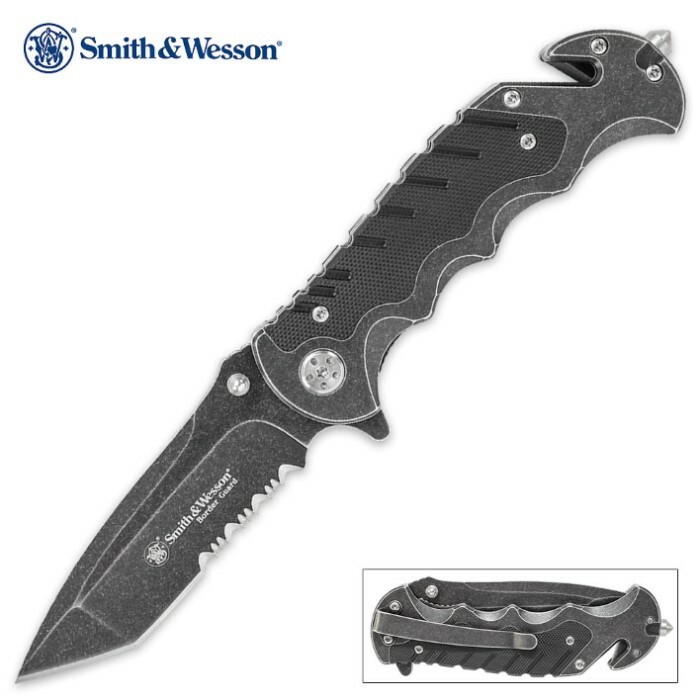 Smith And Wesson Border Guard Pocket Knife | BUDK.com - Knives & Swords At The Lowest Prices! When you’re patrolling the border, you want a great utility knife that you can count on in any situation. Smith & Wesson presents its Border Guard Pocket Knife and with it you get the tried and true Smith & Wesson quality. This folding knife has a stonewashed 7Cr17MoV high carbon stainless steel, partially serrated tanto blade with ambidextrous thumb knobs, thumb ramp jimping, and index flipper. The stone-washed, stainless steel handle has black textured and grooved G-10 inserts and a liner lock to hold it securely in place. It also features a strap cutter and glass breaker. A pocket clip makes it easy to carry every day.